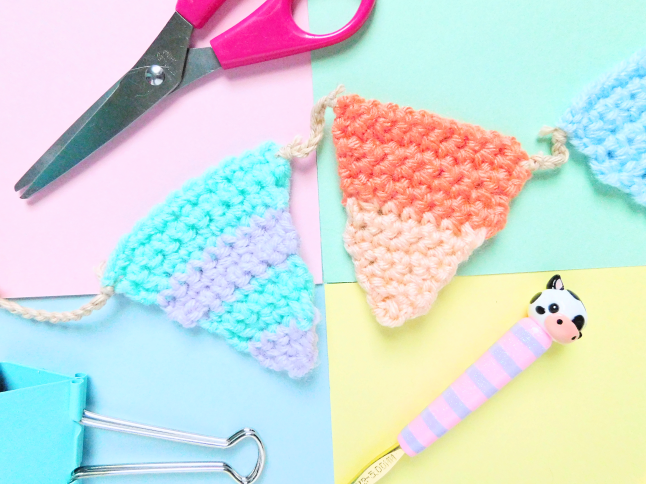 Today I have a really simple crochet pattern that is perfect for beginners. 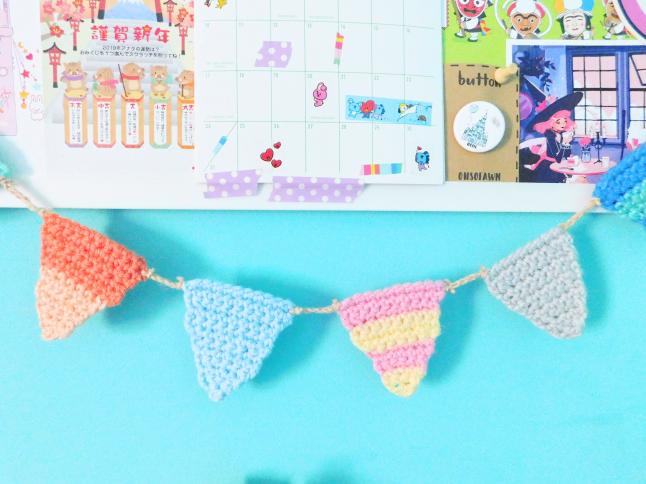 I felt like my desk needed something extra so I decided to make a striped garland. I left some of the triangles solid to balance the garland and I'm happy with how it came out. It really brightened up my desk area and puts a smile to my face whenever I look up at it. 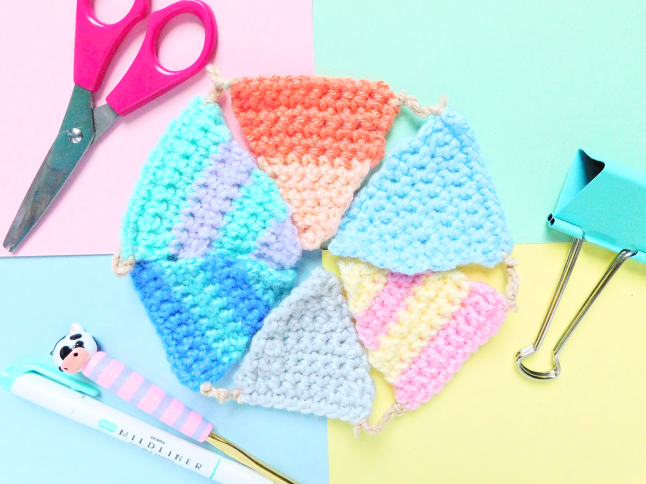 This pattern requires decrease and color change so if you are new to crochet and haven't learned how to do this then now is the perfect time to learn! Just look up how to decrease and color change and tons of articles and videos will pop up, both are easy so beginners should be able to pick up quickly. 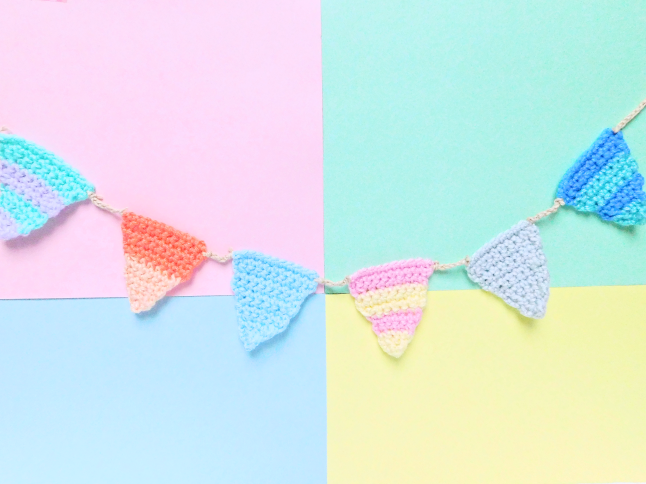 If you have a difficult time with the color change you can always choose to keep your garland solid instead of striped. I first uploaded this pattern to my Patreon. 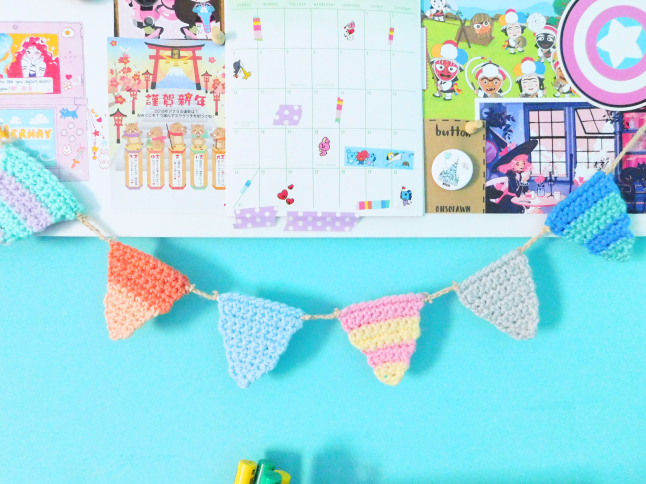 Join my Patreon to get first access to some of my crochet patterns. I will be posting some K-pop fan sticks crochet patterns next! If you have any problems with this pattern feel free to contact me so that I can make corrections to the pattern. There are several color options you can choose from. I made three different as you can see above. 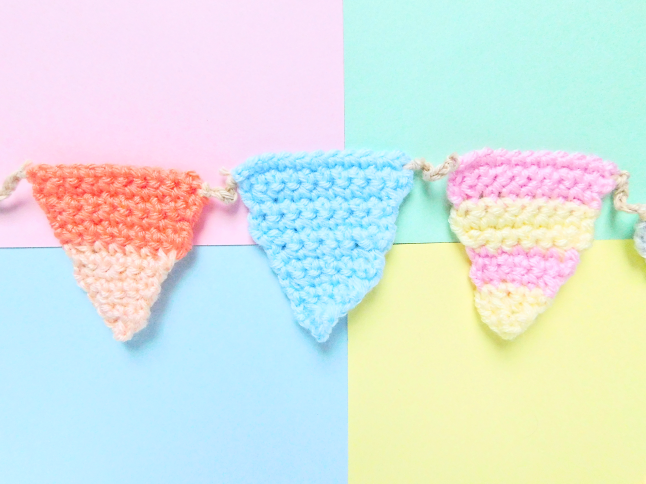 To make the half-colored triangle, use one color for rows 1-7 and the second color for rows 8-12. To create the garland, ch 10 sts, slst to 1st ch to form loop, ch 10 sts, slst to the upper left corner of one of the triangles. To attach the rest of the triangles, ch 5 sts and slst to corners. Lastly, ch 20 sts, slst to 10th st from hook to form right side loop. Weave in loose ends. This step is optional. Cut out some triangle shaped pieces on the felt and glue on the back. This keeps the pieces from curling up and helps keep the weaved ends from unraveling.